Article first published as Theater Review (Seattle): next to normal by Tom Kitt and Brian Yorkey at the 5th Avenue Theatre on Blogcritics. Landing on the right side of the maudlin/moving scale can be difficult, especially in the realm of musical theater, where subtleties don’t always make the jump from stage to audience. But Tom Kitt and Brian Yorkey’s next to normal has its head and its heart in the right place, resulting in a rock musical with the right blend of pathos, humor and attitude. Yorkey’s book tells the fundamentally depressing tale with panache, respecting the seriousness of the situation while allowing room for moments of biting humor. Complementing it, Kitt’s score rollicks along with irrepressible energy, careening from one idea to the next, and echoing the inner torment of the bipolar character at the heart of the show. Now on stage at the 5th Avenue Theatre through March 13, this touring production stars original Broadway cast member Alice Ripley, who won a Tony in 2009 for leading actress in a musical for her performance. 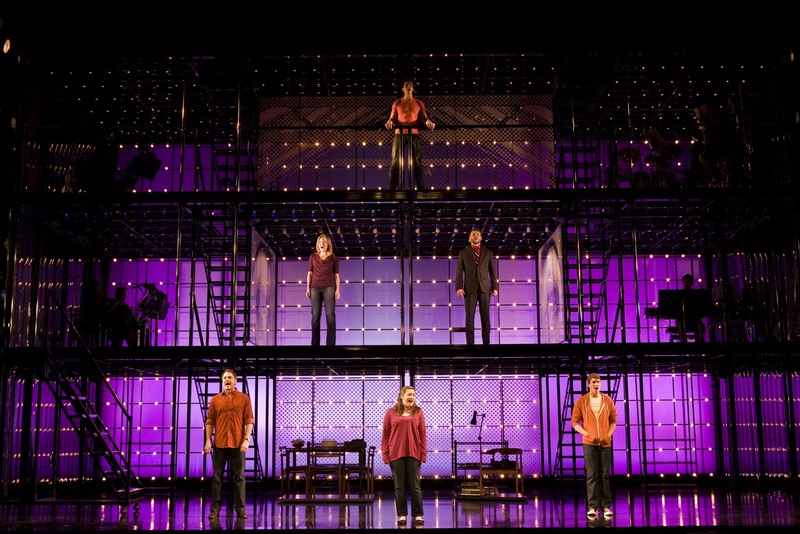 next to normal also won Tonys for best original score and best orchestrations, and is in exclusive territory as one of the few musicals to win the Pulitzer Prize for drama. Ripley stars as Diana Goodman, a woman in the throes of mental illness who is trying to retain some sense of normalcy alongside her family—husband Dan (Asa Somers), daughter Natalie (Emma Hunton), and son Gabe (Curt Hansen). She struggles with the mountain of medication she’s prescribed by doctors (Jeremy Kushnier plays several), but is urged to keep her bipolar disorder under control by Dan. The delicate balance is upset by a shattering revelation early in the first act when Natalie brings home boyfriend Henry (Preston Sadleir), and his inquisitiveness unearths a painful family secret, sending Diana into a tailspin that she may or may not recover from. Yorkey’s lyrics and Kitt’s music embrace classical musical theater elements and hard-charging rock riffs in equal measure. The score scarcely quits throughout the show, and the precisely tuned orchestrations make it an absolute pleasure to listen to. The book effectively illustrates the tension between the characters that arises from a lifetime of unstable behavior from Diana, as well as the implications that accompany overmedication and the regimenting of life into a series of pill bottles. The set design by Mark Wendland echoes themes of compartmentalization, with a three-story stack of steel boxes that can act as either domicile comfort or constricting prison. Michael Greif’s direction spreads the actors across the space, constantly shifting them from area to area with precision. If there was one disappointment about Thursday’s opening night performance, it was provided by the enormously talented Ripley, who I only hope is dealing with sickness. Her performance was commanding and strong, but her voice clearly deteriorated throughout the night, moving from slightly off-pitch to a straining approximation of what she’s capable of achieving. It’s a testament to how good the show is (and how great her fellow castmembers are) that the significant vocal problems only registered as a minor speed bump along the way. Hunton especially impresses as Natalie, allowing real vulnerability to appear around the edges of the character’s tough girl persona—while her set of effortlessly versatile pipes might make you think this musical theater thing is easy. On paper, next to normal looks like yet another modern musical with a rock-oriented score that deals with ostensibly difficult subject matter. The issues it confronts aren’t approached in a terribly novel or insightful manner, but it’s supremely accomplished when it comes to tone, structure, and emotional weight. It’s never in danger of losing itself to sentimentality or snark, and that’s a razor-thin plank to walk in this day and age. next to normal is on stage Tuesdays through Sundays through March 13. Tickets are available at 5th Avenue’s website.